One of this year's Independent Games Festival Student Showcase winners, Rooms by HandMadeGame is a clever mix of point-and-click and puzzle elements that together create an engaging game play experience. One word of caution: the game files are huge and may require considerable time to load. Kim JongHwa—of Seoul, South Korea—is the brilliant young mind behind this game set in a mysterious mansion with rooms that move and that contain magical items to help you make your way through. Using both mouse and keyboard, use the items you find and slide the rooms into the correct configuration to make your escape. The arrow keys on the keyboard are used to navigate your in-game avatar through each room, up and down ladders, and through doors. Use the mouse to click on items to activate or to pick them up. Once picked up, press and hold the mouse button on the avatar to bring up an inventory select control. To physically move the room you are currently in, press and hold the mouse button anywhere on the room itself to bring up a room navigation control, and then select the desired direction. Along the way you will find newspapers lying about. These contain helpful information about new elements of the game being introduced, so it's a good idea to take a look once you pick them up. If you like Rooms, be sure to check out the new version Rooms: The Main Building. As you complete each level, a puzzle piece in the shape of the final room configuration for that level is added to a picture comprised of shapes from all of the levels in the game. The indicator on the left (just above the reset switch) shows how many rooms are in the correct position for the level. You'll need to have each level in the correct configuration to fill-in the meta puzzle completely. 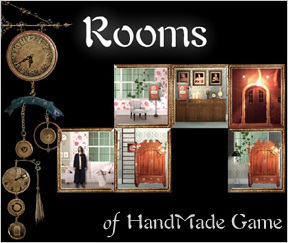 Analysis: Rooms is a delightful game with spectacular presentation and art direction. The video animation of the avatar is very nicely done, and the seamless movement between rooms as well as the movement of the rooms themselves provides for a decent level of immersion. The background soundtrack fits the theme of the game well, and the sound effects are spot on. It's a rare beauty of a Flash game without a doubt. The downside to this wonderful experience is that the game files are huge and take a long time to load: 15MB for the compressed ("compact") version, and 30MB for the high quality version. JongHwa has made the files available for download to your computer, or you can use the links provided above to load the compact version into your favorite browser. JongHwa is allowing us to host the game on one of our media servers to make it more easily available to the JIG community. If you wish to view the high quality version in your browser, please first check your browser's disk cache settings since it may be insufficient to hold the entire file. Setting it to 100MB for temporary Internet files is recommended, otherwise the browser will need to download the file each time you play (please be considerate to our bandwidth). Here's a link to the browser-based high quality version. Looking for a walkthrough for Rooms: The Main Building? Alright everyone, here's a walkthrough for the first twelve levels. My solution to this one leaves one room out of place, anyone know how to fix that? Pick up compass (Room Rotationer). Move center room up, then left. Move room right. Climb up. Move room left twice, then down. Walk right * 3 (to the other cupboard room). Move room up. Move room left. Climb down. Walk left. Move room up. Walk right. Climb down. Move room left. Walk left. Move room up. Walk right. Move room right 3 times. Climb up. Exit. it sure takes a long time to load! Got it to load and I LOVE it. place where you have to put out the fire. Keep drowning. =( help? btw - I just downloaded it; it's easier that way. when you drain the lower room, it reveals a fishbowl; pick it up and put it on, that'll let you go through the water. Grr. Stuck on 12. Help? direction changer things? I'm stuck there, now. And it doesnt feel as simple as the fishbowl trick. haha. It seems to me that the game hits some kind of bug after level 13 (the one where the bus first comes in). I have solved it, but the game doesn't continue. Has anyone been able to get into level 14? This is on the downloaded (high quality) version. download did not work very well on my poor little laptop I could not get past the first doors unless I pressed forward on the menu. I think this may be more my laptop than the game though. To get through the doors on the menu, did you trying pressing [up] arrow? after it loads I only get a black screen. Is this usual? What to do? This is truly a masterpiece. Normally I am just not patient or clever or both enough for puzzle games; here, however, I just made it to level 12 and I feel like opening a bottle of champagne. I'm not sure if I'm stuck or hit a bug. Level 11 I was moving wardrobes when suddenly the character was in dark space (no room) and looked like bubbles from drowning, and game over. So if it's not a bug, my question is, do you rotate the ladder room before or after using explosive? I rotated it then used explosive but then was stuck not being able to move the room where I needed to exit. Also is there a save feature? If I close the game will I come back to where I was? stef - that shouldn't happen, but it could if your disk cache is set too low. The game file actually is loaded twice, once for the preloader to show progress, and then once that's done it's reloaded again. The black screen, could indicate that your browser is re-downloading the file again. I suggest either increasing your browser's disk cache limit to 100MB, or just go with downloading the file using the download links to FileFront in the review above. There is no save feature, unfortunately. Walking outside of a room where there is no other room is similar to drowning. klick on a hatch-like thingy on the floor of the formerly flooded room. This gets the water back into the room where it was at first. Can somebody help me. I'm a mac downloaded verison I think it's the compact one. It won't open. I went to adobe and got the lastest version of flash. Help! stuck after 13 too. bus stop #2 tile got stuck trying to leave the screen up top with the bus running in it over and over again... caught in a loop. was a great game though. As an FYI, Filefront doesn't play nicely with Firefox (or with Mozilla Spacelemur, because of FireSomething). After trying several times to download it and getting redirected to the front page, I opened Internet Explorer and downloaded it the first try. Jay, I had the same problem as Atom did, so I tried your suggestion. It will not let me choose to open the .swf with the SAFlashPlayer. I have a macbook running OSX 10.4.8, and I downloaded the High quality version. Thank jay but it didn't work. It's unhighlighted I pressed all apps but it still won't work. I'm still on a PowerPC Mac, Powerbook G4 running 10.3.9. I'll try it on my mom's MacBook when she gets home. Perhaps the stand alone player is not available for Intel-based Macs yet? Have you tried dragging the SWF to a browser window? I've given up I'm going to try it online. How do you change your disk cache? Because I read the post earlier about black screens. Arrrgh. I'm stuck on L11, and have been for a while. Does anyone have a hint on how to get that room with the 3 walls out of the way? So stuck on the level with the first room rotaters- help? Please? I can't believe you guys are playing! I loaded the game like 10 mins ago, and it still wont work. It's like this blank screen. Please, anyone got any ideas to why? It sounds like a great game and I'd like to get in on it. Nameless: Sounds like it may be loading the game again, which could happen if your browser cache isn't big enough. Try the download version? I hope when i play the game again after they fixed the bug, i won't have to do it all over again to 13th level. Move room to the right. Move room to the left. Ahh, that's perfect. Thanks, Thomas! Nice. I got to 13th level on my own, but then when i jumbed in to bus about 3rd time,i never got my dude out!! So there went over an hour of my time with very nice game and ended up so bad way with the bug that it gets me angry.. I'm looking forward to finishing the game. Yay! Thanks for that piece of info, Jay and JongHwa! Too bad there's only one more level, but I guess it was apparent from the puzzle. Advancing through the level doesn't give you the puzzle pieces for the rooms, so I guess I'll have to play it through again, once Kim got to fix the problem with #13. Still an intriguing and original game. Keep 'em coming, JongHwa! I loved the game for its mechanics and concept, but I have to disagree about the graphic style. It was interesting to add live-action animation and it was well-done, but it just seemed out of place for a game with such simple (but challenging) mechanics. I felt they got in the way of what was a great puzzle game. Movement was slow and frustrating for a game that makes you try many repetitive combinations of moves to succeed. Load times are a problem for some. A very creative game, but once you got past the initial "wow" factor of the graphics, I think the choice of style subtracted from the game more than it added. Still great idea, thanks JongWa for a fun game, and thanks Jay for a great site! JongHwa uploaded the debugged version of the game late last night, and I replaced the browser-based versions with them as soon as I received them. The debugged versions are available at the download links given above as well. Love this game but am stuck on level 13. I too had the problem with getting on/off the bus. But now have gone to the updated link. Bus works fine just have to get in the right position. However, I can not get past the water room. Turn the hydrant and I drown, no matter how fast I move. Can't find a helmet. Help! The bugs seems to still be in the high-res version. Got stuck on the bus....again. Be sure to empty your browser cache before reloading the game if you had already tried playing the first version. If you are experiencing the same bug, chances are your browser is giving you an older, cached copy of the game. I love this site. Usually I enjoy the games...but I have never been so frustrated with a game as I am with this one. It slows with each level and I still can't get level 13. I guess I'm not sure how to clear my cache. Any help would be greatly appreciated. Has anyone figured out how to get past the water room on level 13? Just can't move fast enough. (And yet I was able to solve that room before when it was the buggy version.) And I also found the bus ride buggy sometimes. Does that help? The next time you try opening the game in a browser window it should redownload the whole thing again. That's a sign the cache was cleared. I also get stuck on the bus. Anyone know when this problem will be resolved? Use the hydrant, and run for the ladder to the key. I've been within a few pixels of safety, but I really don't want to play puzzle games for their split-second timing. I always drown on level 13. What's the trick to surviving? Dus any1 no how to stop this? How can you play this game on a mac? There is definitely some timing bug on level 13. Because before the game was fixed it was easy to get down the ladder without drowning, and in this fixed version getting down without drowning is almost impossible. Is there going to be another bug fix or we have to deal with split-second timing, because it takes fun of playing this game. you can fill the hydrant room half-way with water by moving it while it's filling up. then when the hydrant room's half filled, move it right and then climb to 3, etc. I am having the same problem as griffin88 - level 1 starts and my guy immediately shrieks, falls over, and dies. I never get to actually do anything. It only does this at work, not at home. . . . Any thoughts? I feel so dumb... Every time I start the game the guy falls and does this stupid scream and dies within about 3 seconds. I've tried all I can think of to stop it. What is going on here? the guy walks so slow, but at least I can play it. I like the music. the puzzle looks like a key to me..?? ah..i still have a long way to go.. Since the 'bug free' game was made available, I can't get past level 9 - the next level just doesn't load and I am stuck with the 'jigsaw' picture. Before, I got to level 13,just drowned a lot. A newer version (1.25) is now available at the links above, both browser-based and download links at FileFront. JongHwa has been working very late hours trying to get all the bugs fixed, and he has just delivered the latest version that we put up without hesitation. Hopefully this latest release fixes the bugs once and for all. There's no way to arrange the rooms such that you'd be able to flee to another room after activating the fire hydrant. You don't need to worry about the toilet until after you've gotten the plunger. For now, level 13 was just too easy to solve! great! I tried to play the new version but it was a black screen. I then downloaded it but it turned off while I was playing. Can I get a walkthrough for 14 PLEASE !!!!!!!!!!!!!!!! Nice game, i can't have the 100% complete, but i pass all the 14 levels! how do i align rooms in level 14 in order to flush the key out?? Begun 4 hours before, and just cleared. Level 14 was most difficult but most interesting. I just don't see how to get the plunger without drowning. You have to have an escape room to the right of the hydrant because you can't walk down. But above, Dan said "There's no way to arrange the rooms such that you'd be able to flee to another room after activating the fire hydrant." Someone *please* give me a hint on how to get the plunger. I've been fighting this level for 3 days without any headway (no pun intended). Love the game, stuck on L14, got 2 plungers, still can't find the key after repeated "flushings"......????? take the newspaper and read. get to the box with the shelf. move it above to the box with water. exchange with another shelf with the hydrant. turn on the hydrant, when it's half way done, click on the shelf to exchange - that's what it meant by tip 2: don't try to be perfect. move the box to the right, get down the ladder and go to the box on the left, take the plunger. go into the box with the shelf again, move twice to go to the top, walk to the toilet bowl and plunge out the rotator, take the rotator. reach to the box with the wooden ladder, move down and go to the box with exit sign (the one with the plunger before), use rotator to rotate this box to the left. go to the box with wooden ladder,move to the left. go down to the box with exit, walk towards the next box, move this box below the box with the shelf. go up the ladder and walk to the most upper left box (with the light bulb), move this box down once. go to the next box with the ladder, move it below the box with the toilet bowl. go up the ladder, walk into the box with the shelf, move it down once - notice that there's a perfect pipeline being form starting from the toilet bowl. got into the box with the toilet bowl, flush it! go get the key in the box with exit sign. move the box with exit sign next to the locked door. unlock the door, walk to the open door to end the game. Sry for the double post but i finally got the timing right. Thanks!!! Despite the frustration of having to download this large (for a Flash) game multiple times, I was really captivated by the look and gameplay, it's unique and very beautiful. Great job, Jong Hwa! And thanks Jay for helping host it. One of the most interesting, and awesome games I have ever played....the graphics and artwork are off the charts ingenious, beautifully done, hope you win lots of awards!!!!!!!!!!!!!!! Best game I have ever played, and I hope that you make more just like this one. Dullpunk: When you say: get to the box with the shelf, move it above to the box with water. What do you mean by shelf? How can I getdown the ladder and not drown ? The plunger is it the thing that looks like a bulb ? Where is the rotator ? Gee, so many questions, so hard that game. Tx in advance Dull. Just wanted to nitpick that Kim is the creator's family name and Jongwha is his (might be a female name, but more likely male) given name. :) The names in the game credit are written in family name - given name order, as in Korean. It's wonderful. I love this game. It's a great game with a beautiful designe and so inteligent puzzles. Has the browser-based version been updated? Level 13 still has the bug for me. And why is the downloadable file an exe? If it was just an swf then we Mac users could take advantage of it! Okay, here is the bug I get no matter which version (browser or download)I use. Level 13: The room with the ladder & hydrant does not allow you to climb that ladder when the room is positioned on the left over the water filled room. Nice game. After the first few levels, I got used to the system and solved almost all of the rest with ease. I do wish gameplay was a bit faster, though. But then again, maybe that's precisely why it was so easy: I had time to think. Really good game, took a while to load but was worth it in the end despite drowning several times on the way! I'm having a hard time and getting frustrated with Level 14. I've tried playing it. Could somebody help, please! i really cant pass the second one...i got the paper...but wats that mean? 1155145255? great game, i didnt find 14 that hard. line up the pipes. this can be a little tricky because you have to change rooms a ot to shift most of the room down one space, but it is not too hard. I would love to see a sequal for this!!! how do you do level 14!!!?? I can't play the game! when it finish loading, the screen is completely black and nothing happens. oh don't pay to my previous post: it is long to start. When using the hydrant, wait until the room is half full of water. Then, MOVE THE ROOM AWAY! what's in the "under construction" portal? climb up the ladder and move the final room over and down, but it won't let me climb the ladder! How do I fix this!? hey! help please.. i can't get out of 14! Another vote against puzzle games having things that require split-second timing; I guessed the trick on level 14, but since I couldn't get it to work, I thought it wasn't the intended solution. And even knowing what I'm supposed to do I can only do it once every five times or so. This is hardly fair to the gameplayer. Leave the toilet room in it's place since it doesn't need to move. After you retrieve the plunger, use it on the toilet to get a rotater. Use the rotater on the turned room with the ladder. Allign all the pipes with each other and flush the toilet to get the key. After you beat the game you get a key in the lobby room so you can enter the 'No entry' room. I loved this game and only needed to read a FAQ on level 11, I can't usually do puzzle games at all. This was challenging but not enough to get you completely stuck and give up, a really awesome game in my opinion! It *does* take some time to load, but the game can be set to lower image quality, which makes it play in a more comfortable speed. PS: Boy, do I love this game... it's brilliant! Keymaster - this review is for the original, Flash-based version from which Rooms: The Main Building came. You might want to look on that page for help with The Main Building. Rooms 1.26 is out and i have made a walkthrough for Room 13 and 14. so i will wait and see if this comment is viewable or you can help me out by understanding why Movable Type keeps giving me invalid login. Thanks for this fantastic website. I visit many times each week. i have also tried to create another different Movable Type acct and failed with the same error msg.. invalid login.. i have no Typekey identity.. anyway .. i tried two times.. I recently downloaded the game but I seem to be having some problems in a couple of the levels. Mansion 1, 105 and 404 specifically at the moment. I get the slides in all the right order (even checked with the walkthrough to be sure) but it's not letting me finish the level (can't go up the ladders). Anyone having the same problem or is there something I can do or I'm missing? "Align all the pipes with each other"
HOW?! I've been trying to for hours, and I can't seem to align the elbow pipe that belongs in the west area.